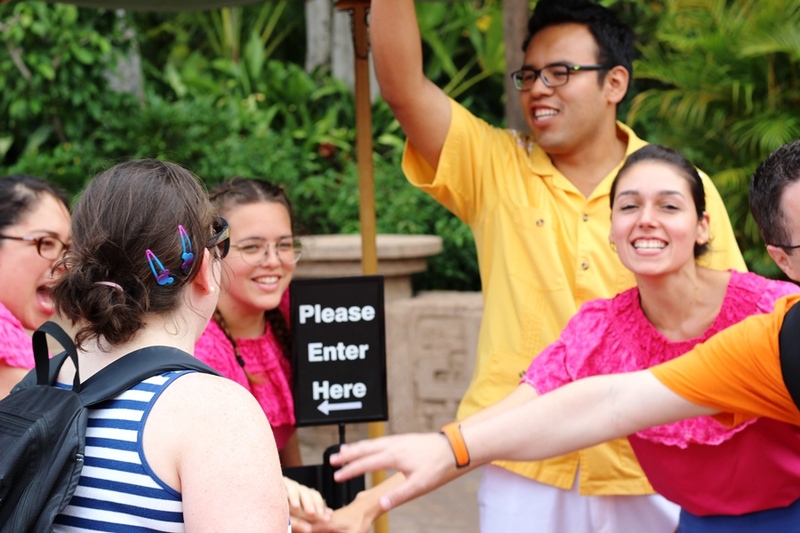 In the long storied history of Epcot, Choza de Margarita has been there for only a blink of an eye, but it has already begun to make an impact on the dining and imbibing habits of guests. While the menu of Mexico’s newest eatery isn’t as extensive as the La Cava del Tequila, it doesn’t skimp on quality and has the advantage of convenient on-the-promenade placement. Though it has only been open for a short while, it is already finding ways to plus its offerings by adding a new margarita, entrée, and side in May. In our first sample of what Choza de Margarita has to offer, we gave the new margarita, Smokey Jalapeno, and the Tostadas de Pollo a taste test. The Smokey Jalepeno margarita is listed as Mezcal Gracias a Dios espadin blanco, jalapeno, cucumber, fresh lime juice, and agave nectar. 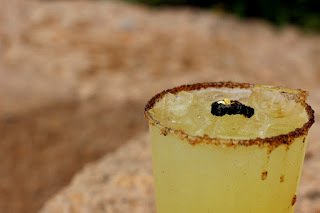 It is served with a slice of smoked jalapeno for a garnish and a black ant salt rim. You can order the margarita without the salt rim, but I opted to order the drink as it was listed. I can see where it would it could churn someone’s stomach to have the salt rim there, but I’m an adventurous eater and I promise that this rim is salty, with a bit of spice, and the consistency of salt grain. It doesn’t look like ants and it doesn’t feel like you’re eating a whole ant. As for the rest of the Smokey Jalapeno margarita, it is refreshing and strong. I really like the fresh flavors from the lime and the cucumber, but the cucumber in particular gets masked a bit by the stronger flavors of the jalapeno. Speaking of, the smoked jalapeno brings the heat along with an almost mesquite feel on the front side of each sip. The agave does a nice job of mellowing the spiciness with its sweetness, but not so much that you aren’t going to feel the jalapeno. Overall this is a very well-crafted margarita that is easy to drink, but that you will feel the effects of once you stand up, and I will definitely be ordering it again. A quick aside, as I’ve said it is a strong margarita, take my advice and do not consume this beverage and then lean back to shoot a photograph directly up the side of the Mexico pavilion. You will get wobbly at best and fall down at worst. 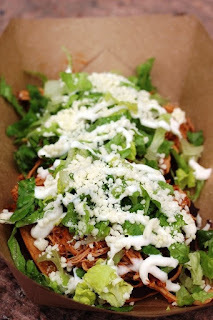 Moving on to the Tostadas de Pollo, this dish comes with two tostadas that are described as crispy corn tortillas smothered with black beans and topped with chipotle chicken, crema Mexicana, shredded romaine lettuce, and cotija cheese. Smothered is the operative word here, and you will be hard pressed to find the corn tortillas by just looking at the dish. They are there though, you’ll hear them as your cutting through the mounds of goodness, and appreciate their crunch in a sea of softer toppings. The black beans and chicken are the stars here with a nice bit of heat from the stewed, shredded chicken and a smooth consistency from the beans. The crema Mexicana and cotija cheese are rich and creamy, expertly holding the assembled components together, with just a hint of sweetness. These were delicious and with a pair of tostadas per order, they are perfect for sharing, but you may want to keep them all to yourself. As this was our first visit to Choza de Margarita I want to take just a moment to talk about the staff. They were knowledgeable and incredibly friendly. In fact, as we were there right at opening, they were doing their morning huddle, complete with a hand raising cheer. They were so excited for guests to be there that several, including my wife, were asked to join in the festivities. The team is really world class all the way around! Choza de Margarita is a great spot that was much needed in the Mexico pavilion, and its availability will likely have an impact on the crowd levels of La Cava del Tequila. Considering how high quality each menu is, paired with the fact that the menus do not feature the same offerings, guests will have a hard choice as to which venue to visit. Both are top notch in my book, and it is wonderful to see Choza de Margarita really exceling right out of the gate. I, for one, will definitely be paying them another visit for the Smokey Jalapeno margarita and the Tostadas de Pollo.